A wani inhabited the inlet of Koga in Shiima province in Watari prefecture, now part of Mie prefecture. It was covered with seaweeds and shellfish and looked like a rock. One day a boat in the inlet caught fire and, unable eto extinguish the flames, the sailors jumped into the sea and were swallowed by the wani. The boat was lost to fire without trace, and there were no survivors. The incident took place during the fifth month of this year. 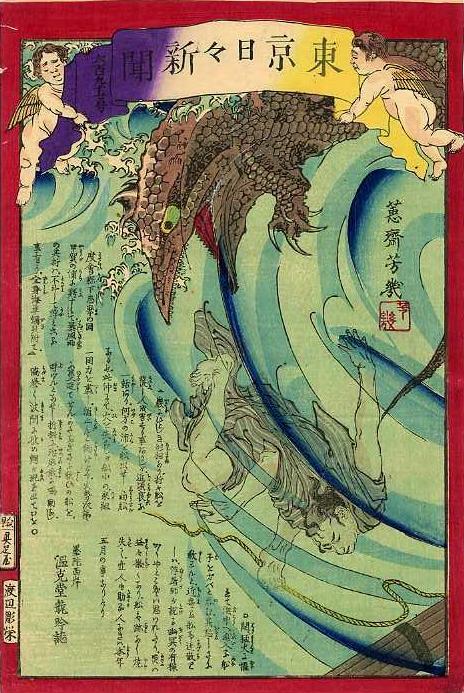 A wani (鰐) was a mythological beast of the sea reminiscent of an alligator or crocodile. In the real world of fisherfolk and sailors, though, it was probably a great shark.